My favorite part of the game, hands down, is the setting and its associated theme. I love exploring, even in real life, and so a theme centered around exploring lost civilizations and forgotten secrets is inherently appealing. Combat is fun, fast, and definitely secondary to the story. 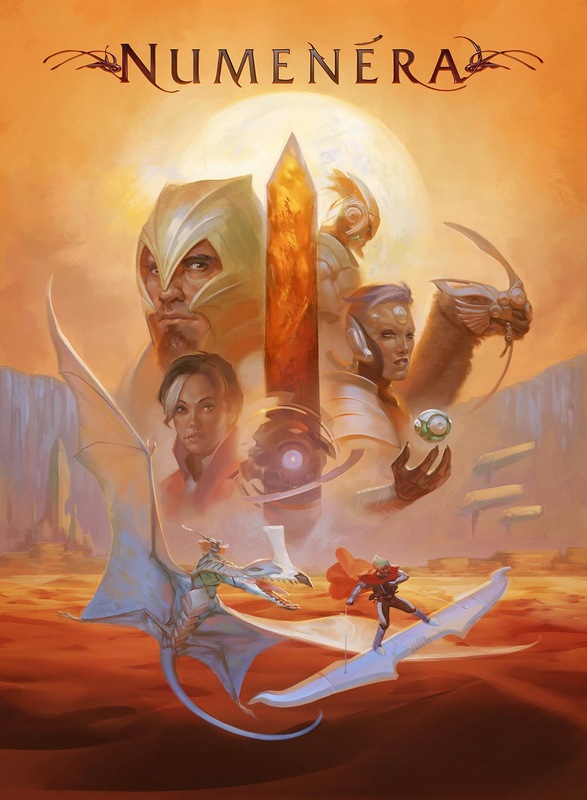 Much of the core book is devoting to setting, but not like Forgotten Realms books. It's not heavy on NPCs and Gods and specifics. It's big on hooks and teasing. I like to be teased, and then in turn tease my players. I'm already offering up the Beanstalk as a hook for future adventure, because it fascinates me: basically a gravometric tower with a manufactured ribbon going up to... somewhere? That somewhere is a place called "adventure". To some extent, almost any system could be fun within this setting, but there are a few ways in which the rules enhance the feeling. First, they are light. 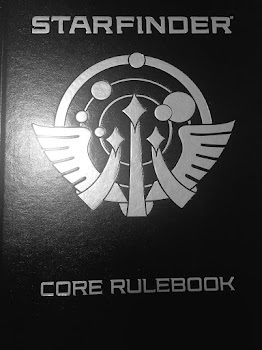 This is not a rules-heavy system. If you can roll a d20 and multiply single digit numbers then you pretty much know the rules. Second, the Cyphers, Artifacts, and Oddities are unpredictable, weird, and mostly not duplicatable. I can be inspired to created unusual one-off items and not have to care what happens. For instance, in this adventure, one player set off a cellular disruption bomb in the middle of a garden to do two things at once: kill baddies, and find the nonorganic plants. Sweet. Sorry about all that food and stuff. Third, characters are vaguely defined to some degree, but the process highly encourages background development and connections to both the world and each other. I haven't seen players do such fun backgrounds for quite a while. And I got to play off of them in the adventure. GM Intrusions were a bit hard for me. These are events or situations that arise as sudden obstacles to the protagonists. It's easy during a fumble because there's always obvious things to work with. Like, when a guy fumbled a lightning bolt and knocked himself back - right off the roof and onto the ground 20 feet below. Take 2 damage and, more importantly, laugh a bit. But coming up with XP-granting intrusions was more difficult and something I need to practice. There's a fine line between "normal plot development" and "GM Intrusion" and finding that line is art, not science. Is that bandit popping up part of the plot, or an intrusion? I couldn't say. I gravitated towards intrusions that made use of character backgrounds and motivations, like dramatically appropriate flashbacks at inopportune moments, or offering a new choice that makes someone stop and think about which course they want to take. I'll get better the more I practice, no doubt. Sure, these rules could be modified for use in any game system, but then - that would sort of make it this system, right? Overall, a good system, worth a look if you haven't already. It's easy to pick up and play with little to no player knowledge of the system, and great for a group that wants a lot of story focus in their games.